Companies are always looking for better ways to promote their products, brand or services. Custom Bumper Stickers Australia gives you complete control as to how your offer is being promoted out there. You choose what message goes on the sticker, the ideal shape or size you wish to use, and the artwork or graphics that will go on your bumper sticker. It is as simple as that. If you are looking for a unique way to promote your offer, then custom bumper stickers would be the perfect option. Professionals like eStickers utilizes the latest printing technology to ensure your needs are met. High quality vinyl is being used so that the final product will truly represent your brand the way you envisioned it to be. The thing with a custom bumper sticker is that there are no limitations in terms of the desires shape, size or quantity. In turn, you can be as creative as you want to be without any restrictions. Professional printing firms offer you various options, which includes the materials you want it printed on. In most cases, either gloss or matte is being used. Businesses can be assured of all sorts of options when choosing custom made bumper stickers. Experts are on hand to offer valuable advice in terms of the right size, shape or materials that will be best suited to existing promotional material used. As a business owner, you want to work with a printing company who serves your best interest and is always evolving through using leading printing methods and ensuring they always deliver high quality custom bumper stickers Australia. This is why you cannot go wrong in doing business with professionals such as eStickers who is always looking out for you and in saving you money. We encourage you to get in touch to see how they can be of service to you by reaching out at estickers.com.au. When any organisation has the need for extensive advertising or exposure but may have insufficient budget available for this purpose then the use of bumper stickers may be the solution to the problem. The use of this method will allow the company a large captive audience at the most reasonable cost available for mass advertising. The measuring of the results can compare favourably with other media but the audience is captured for a longer period. The bumper stickers cam make any rush hour traffic situation a suitable audience for the product or service promoted on the bumper sticker. The main factors making this method the most suitable is the following four points. The audience reach through bumper stickers large and very impressionable as they are either following the vehicle with the sticker or is stuck behind him in traffic. The bumper stickers due to their imaginative message or presentation will attract the attention and without consciously being aware of it read the contents. Due to amount of time this message is available the average person may reread the message several times. The well written message will leave a lasting and positive impression on the reader. Bumper stickers is able to introduce your company or message to the biggest audience available. Statistics has proved that this way is two to three times more effective than conventional advertising. Mobile advertising using bumper stickers is proved to be more effective than any other media. The building of company identity and their increased visibility has proved to be instrumental in increasing the awareness of the brand and identity of the advertiser using bumper stickers. The psychology behind this effective method is simple: increase your visibility and amount of people seeing the logo or message and sales will reflect the positive results. Compared to television and other media advertising the use of bumper stickers is by far the least expensive. Comparing the costs of each media and working out a cost factor per exposure of your product or service the costing of bumper stickers is so small that it is difficult to calculate a percentage. The amount of sightings as well as the time period these bumper stickers are actively working and promoting the message would be impossible to calculate accurately. The last reason making bumper stickers so important is the fact that they strengthened and reinforce a message that other media has presented to the audience. Bumper stickers could be very nice to have on your vehicle but at some stage the usefulness of the sticker may become a nuisance and requires removing. This has in the past resulted in some rather long and messy work for the car owner. This serves to assist in giving a few practical tips and ideas to tackle this project. The best time to attempt the removal of bumper stickers is during periods of hot weather with soap and water and a large amount of elbow grease. Wetting the rag or cloth in the warmest water available and placing it over the bumper sticker for a few minutes will start the removal process. The bumper stickers also responds well to soaking it with boiling water poured over it a number of times. Then peel the bumper stickers by starting at a corner and carefully working towards the centre. If this method is unsuccessful the use of natural agents is required. Use a spray bottle with a mixture of three parts hot water, one part dish soap and two teaspoon rubbing alcohol and soak the bumper stickers well. Allow to soak and then start peeling form a corner working towards the centre. Reapply as many times as required to effectively complete the process. Soaking the cloth in a vinegar solution placed over the bumper stickers for three minutes may be the next alternative. Again the peeling should be from the corner towards the centre until completely removed. The vinegar is ideal to remove the sticky residue left behind when the sticker is removed. The use of a lighter fluid or rust removal fluid can be used to remove a bumper stickers but care must be taken not to damage the surface of the bumper. Many new vehicle bumpers are colour coded and this may cause a shade difference when used. There are people suggesting the use of a hairdryer but extreme care must be taken not to damage the surrounding area on the vehicle. If using this method to remove a bumper sticker the heat of the dryer should be set at the lowest temperature. Depending on the area where the bumper stickersis placed the use of any razor blade or hard objects may damage the surface of the vehicle. Rubbing compound could be used to restore minor and slight discolouration on the paintwork due to the effect of the sun on the surrounding surface. The advent of the bumper stickers is a direct result from the creation of a car by henry Ford in 1927 when he added bumpers to his vehicle range due to customers having accidents. These bumpers combined with the American way of life created a ready means for advertising. The initial crude cardboard stickers looked more like number plates and time and technology changed them into the current format. The next step in the development of bumper stickers was to treat them in a way that the elements and sometimes harsh weather conditions didn’t destroy the bumper sticker in a very short period of time and with the sticky back paper available the modern day bumper sticker was born. This enabled better and more cost effective printing methods and the business world saw the untapped market waiting where everybody could see. The cost of advertising was also a main factor for using this means. Tourist destinations were some of the first to use this new means of advertising and either sold or presented visitors with a bumper sticker displaying an image of their site. Pretty soon this proved to be a huge success and towns throughout the world did the same thing promoting their town as a tourist spot. These bumper stickers became highly sought after collector’s pieces. Industry has been watching these developments and immediately saw a great audience being exposed to their advertising or marketing campaign at a very low cost, probably the cheapest method of advertising in the world. The variety on offer is endless and just about any product or campaign that needs publicity or huge exposure is using this avenue to advertise. More recently in the USA there has been a trend to match car owners willing to display specific bumper stickers of companies willing to pay for the privilege. The effectiveness of bumper stickers are further evident in recent political campaigns especially in the USA to promote the two conflicting political parties and their candidates for office. The list of possibilities using this effective advertising medium is huge and offer a lot of potential for creativity. The oval sticker or often referred to as the Euro sticker had its origin in 1969 when the United Nations decided to identify the origin of vehicle travelling through Europe. The traditional way of identification through number plates started to get confusing as many looked virtually the same from a distance. Their sizes were uniform and colours could be distorted in extreme weather conditions. The answer was found in oval shaped bumper stickers that contained a maximum number of three alphabetical digits or letters. The size of the letters were standardized at 9 inches tall by 6 inches wide and the style had to be capital Latin characters painted in black on a white background. The oval bumper stickers needed to be an elliptical form where the major axis was horizontal. Examples of oval stickers are Australia indicated by AUS and the United Kingdom as GB. The fact that most European countries are in close proximity to each other and the trade between them is conducted on very regular basis this means of sticker identification has made the recognition and origin of vehicles easier. The use of this oval sticker has also created a market for collectors worldwide to collect the various bumper stickers and as new areas become listed or changed this was reflected in their collections. National pride has also played a role as citizens living in other countries proudly displayed their oval bumper stickers, albeit of different sizes to indicate their heritage and nationality when either travelling or moving abroad. This practical idea has been instrumental in creating a complete and exciting new market and the use of bumper stickers has become a huge market that covers a vast range of applications and uses. From marketing to promoting the election of civil servants this is one of the most used tools in the world today and examples of its effective uses are evident around the globe. Stickers from the oval sticker to the marketing or promotional bumper stickers is bound to become even more popular during the future as our eyes are subconsciously drawn to the message it displays without even being aware. Stickers has playing a very large and vital part in the life of the average citizen in countries like America. The humble beginning of stickers started in the 1880’s when merchants began placing stickers on their goods to attract the attention of their customers. These were hand written in the beginning and as the printing industry gained prominence the stickers became a large part of their daily workload. The stickers contained both prices of the goods and later short descriptions of the products. The further development and discovery of sticker labels made the identification of goods easily recognisable and gave rise to this technique being used on postage stamps. Stickers was also used to label luggage and goods when travelling to make it recognisable and identifiable for both the vendors and users alike. Personal use of stickers has followed and the magnitude of uses in the home makes this product a very intricate part of our daily lives. The sticker is used as reminders to family members and during certain festivities stickers play an important part in the household. During events such as garage sales the goods on offer is priced and again stickers is the answer. The part that stickers currently in our business environment range from promotion of products and services, event advertising to making a choice between the current and opposition candidates in the upcoming elections. The sticker has created in many cases an identity for the user and by displaying this sticker on his business or vehicle he makes his preferences known. Many friendships has suffered badly due to the use of stickers that may make or display an opinion not acceptable to the other person. Every business use stickers on a daily basis and the future will yield many more uses for the humble sticker. The ample use of stickers to promote a product, identify special offers or discounts is vital for the continued success of many enterprises. The introduction of stickers has changed our lives in many ways and this is going to become even more pronounced in the future. The use of bumper stickers during election campaigns has many far reaching effects other than promoting the suitability of the candidate or party. Many friendships has been destroyed and some has been strengthened due to the use of bumper stickers indicating your choice in the campaign. There is however a number of ways that the use of bumper stickers can make a huge difference in the politics of a country. The bumper stickers serve the purpose that it could provide a punch-line to a political argument that is current and a highly controversial topic. The wording on the bumper sticker may make fun of certain policies that the party endorse. Both Bill Clinton and Georg Bush has sparked some great bumper stickers to make their appearance. The bumper stickers that comes to mind is, “No One Died When Bill Clinton Lied” and the favourite from Bush is “Do you Miss me yet, signed G Bush”. These two examples is in a way poking fun at certain mistakes of the candidates reflecting on their party and could make even their non-supporters smile. The bumper stickers can assist other to make unpopular stands against current practises. This could be against war policy of the current regime in other countries. Support for the troops employed fighting wars that no everyone is comfortable with but the welfare of their fellow citizens fighting is. Support for veterans of previous extremely unpopular campaigns now facing hardship due to lack of support from the government has been the subject of many bumper stickers. The use of bumper stickers to raise awareness of a specific person or issue is very important part of any political campaign. The primary use of the bumper stickers in this instance is to introduce the candidate or issue to the public in conjunction with other media advertising. The more exposure the candidate or issue received through media and other methods the better the chances of success of the project. Raising funds for sensitive issues has found this use of bumper stickers extremely useful in the past. The role of bumper stickers has played its part in a number of non-trivial roles involving the changes in the dynamics of politics in most countries. Their role in future political campaigns is going to become even more vital and important in the solving of community concerns involving the political arena and its components. Bumper stickers are part of daily life and will remain so in the near future. What is a Bumper sticker? The bumper sticker can be simply described as a message printed on an adhesive material displaying a message and attached to the rear bumper of a motor vessel. The material used in the process to create a sticker can range from paper bumper stickers to more durable vinyl or plastic coated stickers. The main aim of a bumper sticker is to create a sticker of which the material will last as long as possible and have a means of removing the bumper stickers should the need arise. The various applications that made the use of stickers so popular started with the oval sticker and then followed the town sticker. The town sticker was initially the crest of arms of the town or city followed by its name. This sticker become immensely popular among the camping community and they attached the bumper stickers to the rear bumper of their caravan or trailer to proudly present a record of their travels. The next step in the progress of bumper stickers was the promotion of government elections and this type of bumper sticker still represent a fair amount of any official election campaign. The use of stickers can include logos to either present the reader with information or to signify certain believes or preferences by the owner. Examples is political party, clubs, outdoor activity and church affiliations. The first type of stickers were attached to the bumpers with wires and at later years followed by the use of adhesive tape. There was also a stage where screen-printed cardboard was used to make bumper signs from and was a crude form of sticker. Certain countries however such as Sweden has regulations that prohibit the application of bumper stickers on vehicles and this has moved the sticker to the rear window of the vehicles. The residents of the United Kingdom has not been very comfortable with the use of bumper stickers and the use of a sticker on certain expensive luxury vehicles is a rare sight in most countries around the globe. The Ferrari motor company use stickers on some parts on their high performance vehicles as a means to promote the brand. While it is true that you could pretty much do anything from home these days, including stickers printing due to modern technology and state of the art software, the quality and durability pale in comparison to what can be achieved when using professional sticker printers. At E Stickers we are not just about product; our world resolves around you as our customer. This is why we go to a lot of trouble to source the best materials, ensure we utilise state of the art equipment and see to it that our gallery of sticker styles and designs are continuously updated for your convenience. Flexography – Speed is of the utmost importance when it comes to printing stickers. In this regard flexography certainly does not disappoint anyone. Our engineers would turn out a master print to send to you as proof of what we would consider to be a piece of art. This same masterpiece would then be used to print the desired image on the sticker before the plate would be rolled over the material our clients selected. This is one of the most popular ways to print stickers nowadays. Digital Printing – This form or printing is fast and effective and allows for last minute changes such as colour changes, which makes it a popular medium for online printing. With digital stickers printing, the ink would remain on the paper rather than being absorbed by the paper. In a commercial setting, digital printers would forward the final design directly to the press without the need to still bother with plates. Offset Printing – In this case, the image would be transferred from the rubber cylinder to the paper. This form of printing allows for several colour options and is favoured due to the excellent, clear and crisp quality colours achieved by offset printing. Do not be fooled into thinking you can print top quality stickers should you own a digital printer. The durability and texture simply can’t compare to that of professional stickers printing presses. Expert sticker printers like ourselves have the expertise and equipment needed to print high-quality colour stickers in various quantities at discounted prices. We believe the best materials create a strong visual experience that is attractive and appealing enough to attract interest from your target market. In addition, our large selection of sticker designs and colours makes it so much easier for you to do business with us. Why wait longer than you have to get your stickers printed, we invite you to get in touch today by calling our customer services team on 1300 97 98 99 right away! Buying labels and stickers online has never been easier with E Stickers. Sourcing the right size, colour and shape is an effortless procedure and can be done in the middle of the night, or first thing in the morning. It is entirely up to you when you choose to order online. Place your art or create your design: Using our simplistic design tool, you could either place the desired art template or start creating your own design where you can add your shape, images, colour, text and more. We do not cut any corners in terms of customer satisfaction and stickers online. At E Stickers, we show you the way and make it super easy for you to create your own stickers online for any occasion. Whether it be for birthdays, weddings, business events or hens nights, you are spoilt for choice with our wide selection of online stickers. Make your selection from all sorts of shapes such as ovals, rectangle, stars and more to create your own stickers. Alternatively, you may simply make your pick from our existing designs. People everywhere love stickers. They’re fun, colourful and can be printed in small or big sizes. Everyone makes use of a sticker at some point in their life. Teachers would use them in class while small business owners would use it for marketing purposes. There is a couple of things that would require your careful consideration before you approach a sticker printing company. Paying attention to what your stickers should say is one of the first things you ought to think off. For one, you would need to have your business name and contact details listed. Never lose sight of the fact that your stickers need to be colourful and the right size and shape. What is more, customisation does not stop at the desired image, you want the sticker that you printed to last. Therefore, you’ll need to enlist the services of professional like ourselves. Furthermore, you need to decide beforehand as to what kind of material you want for your stickers. Top sticker printing firms make use of a process known as the flexographic process, which prevents stickers from cracking. It makes good economical sense to use stickers for promotional purposes. This is why local giant merchandisers and franchising companies make it their business to create an awareness of their brand through using inexpensive promotional materials like stickers. E Stickers design their stickers in such a way that it will adhere to windshields, car bumpers, refrigerators, planners, bags, walls, notebooks, and any other surface imaginable. 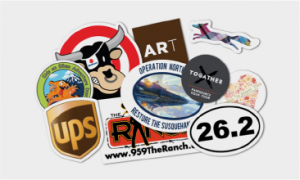 What Makes Sticker Printing Such a Viable Business Tool? You do not need any additional accessories as you would simply strip off the backing, then place it on a variety of materials such as cement, wood, cotton, plastic and even steel. Your sticker act as a mailing address, branding label, advertising accessory, peel-off business card or as a poster. Printing companies like ourselves offer all kinds of solutions to ensure your stickers truly stand out. 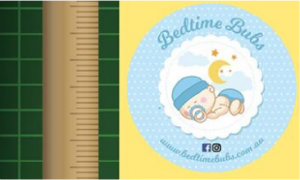 As far as sticker printing is concerned, there are various choices and customised features on offer in terms of details and all sorts of varieties that can be quite dizzying to figure out. The materials used would be either vinyl or paper. The latter would be either uncoated or comes with UV coating. Whereas vinyl is way more printer friendly and far more durable to give your stickers that ultra-gloss finish. There are various creative uses on offer with either one of the two, whether you choose paper or vinyl. You are invited to contact the experts at E Stickers to find out more about the various combinations on offer by dialing 1300 97 98 99. E Stickers is in a strong position to print just about any type of stickers you can possibly imagine. We have a broad range of shapes and sizes, and offer various options in terms of material – from durable, glossy vinyl to paper that results in a superior look and feel. It is our mission to boost your sales by printing stickers that will make your products or services stand out as different to anything else out there. To ensure quick turnaround, E Stickers utilise state of the art digital printing techniques and equipment in order to transfer images and graphics directly onto your printing stickers material. One of the key benefits from doing this is that small business owners can afford professional stickers. Allow you to manage the way your stickers will look from starting the digital printing process to completing it. Guarantee customer satisfaction in that we provide free press proofs of the stickers to be printed before the order gets finalised. Offer electronic proofing in PDF form should a faster turnaround time be needed. Whether you want to create an awareness of a cause close to your heart or you intend running an event, Custom Stickers will serve your needs one hundred percent. It is very easy to pull off with our unique and insanely easy editor. What is more, you will experience absolute perfect print quality once the actual printing has been taken care of. All you need to do is upload your desired image or logo and e Stickers will create some of the most amazing stickers for your event or business in any size, shape or quantity. You can use it alone or combine it with ready to use lettering for affordable customised printing. The beauty of customised stickers is that you can have them made to your exact specifications regardless of shape, size or image. Once you’ve uploaded your artwork, the option of creating just about anything are within the power of your hands. We will design stickers for sporting events, weddings, as corporate gifts, or for whatever occasion you have planned for. E Stickers even has a library of templates and images you can make your selection from. If you design your own artwork or logo, then you simply need to upload it to the sticker editor we provide. Custom Stickers are made up of top quality, clear, white or coloured vinyl material. Best of all, it is waterproof, weather resistant and strong enough to stick to any surface or materials. In terms of removing the stickers, they can easily be removed with no messy residue left behind. Do you wish to include text? You can write it in while making your sticker. At E Sticker, we let you do it your way. Why not place your order for Custom Stickers and solve all your sticker needs by calling 1300 97 98 99 today! Colour – There is a good reason why you do not generally notice bumper stickers with varied pastel colours going all around town. After all, lighter colours are not that easy to detect from a distance, especially if there are not enough brighter colours to make it stand out. Therefore, great care should be taken to ensure you choose bright and bold colours that actually command attention once seen. Commonly used colour combinations would be black and white or black and red. Words – Precision is the name of the game as far as your wording is concerned. Often times less is more. Having too many words on your sticker would mean your font has to be smaller, which in turn makes it harder to read. It is in your best interest to try and condense what you need to say into as few words as possible. Graphics – Generally speaking, custom made stickers have some eye-catching colours coupled with a few words. Using graphics is often recommended when you have a short slogan with a lot of blank space around it. As long as you ensure you come up with something interesting and appealing without distracting from the message you want to convey. In our opinion, the worst thing you can do is to make your custom made stickers look too busy or crowded. Rather stick with eye-popping colours, and sleek slogan, adequate wording and exciting graphics. Colourful stickers truly stand out and attract many an eyeball to your message or slogan as reflected on your customised sticker, whether it got placed on the body of cars, shop windows, bus stops, iPods, bags or anywhere else. There are various ways to achieve sophistication with your own customised sticker or label. Design, style, colours, images, graphics, slogans and customised text. All you need to do is make use of our super easy online design tools that will assist you in selecting the right size, image, background and colour for your chosen design. This will ensure you come up with amazing, yet attractive customised stickers that will set the world around you on fire. If you are looking to get more business and more customers, you may want to consider using Custom Bumper Stickers in order to get your message out to fellow Australians. Come to think of it, stickers are absolutely everywhere and not used for cars anymore. What makes bumper stickers such a popular advertising medium and why should businesses use it to brand their business? Just take a look around you next time you are in and around town. You might be pleasantly surprised to find stickers absolutely everywhere. Not only will you find it on bumpers, but on lockers, backpacks, and even skateboards. Once seen, people can’t help but take the time needed to read the slogans on them. Now imagine the bumpers stickers were customised to reflect your brand by a sticker company who places a lot of emphasis on developing your core message to your target audience. This is the power of advertising in a whole different way than what you may have envisioned. Unlike t-shirts that are only worn now and again, Custom Bumper Stickers work all of the time. This will be the case whether your customer is merely sitting around in a nearby cafe with your sticker on their laptop or they are busy traveling around town. The point is that your bumper sticker in its customised form is always advertising your products or services no matter where your customers go. Everywhere they go, someone new is always seeing the sticker and are wondering what it is all about. In comparison to sweatshirts, caps or custom t-shirts, bumper stickers are way more affordable and can be purchased in bulk at much lower rates. This alone makes it super easy for business owners to give bumper stickers away in the hope of reaching their target market this way. One thing is for sure, your brand is always in the public eye and it makes perfect business sense from an investment point of view due to the low cost and the favourable return on invest. Whether you desire lovely graphics in the background or something a little more plain with only your business name and web address, your options are unlimited with e Stickers by your side. You can bring out your creative side in ways unimaginable. With customised bumper stickers, you can play around with a variety of clever catchphrases and witty quotes. You are not even limited by the sky in terms of what you can all come up with. People simply cannot get enough of bumper stickers. At the end of the day, there has never been a more affordable and easier way to get your name out there than making use of Custom Bumper Stickers. What is more, with a cleverly designed and top quality bumper sticker by reputable sticker companies such as e Stickers, there is simply no way that people everywhere will not notice your product or brand and get in touch with your company to find out more what it is all about. Do you want to take your marketing to a whole new level? Now you can by simply getting in touch with one of our representatives on 1300 97 98 99. Getting your point across using Bumper stickers are now easier than ever. After all, they cover a variety of topics ranging from announcing major events to demonstrating your fans’ appreciation for your brand by displaying it on their vehicle for the whole wide world to see. While it may be the easiest way to buy some sticker transfer paper and then print them from the comfort of your home, the quality will be less than desirable. Unfortunately, it will appear cheap. This is where e Stickers come in. The quality of the paper used to print your Bumper stickers is high class. In addition, the printers used have the ability to handle various graphics, numerous fonts, and a large variety of ink colours. Even though you would pay more than doing it yourself, there is simply no comparison in terms of the quality. How many times haven’t you seen people from all walks of life sitting in traffic, having their morning coffee while staring in front of them? Wouldn’t make sense to give them something useful to stare at? This is where an impressive looking Bumper sticker with a catchy slogan comes in handy. Business owners will do well to get top quality bumper stickers printed to showcase their products or services. As you can imagine, road users will naturally become curious and be tempted to either visit your website or give you a call to find out more about your business. This is one of the best ways for business owners to establish a connection with prospects. Believe it or not, businesses who use bumper stickers recorded massive increases in terms of sales and revenue. It makes logical sense to go with this form or advertising. Not only is it much cheaper to the business owner than conventional advertising methods, but their customers are sure to apply the Bumper sticker, they received for free, to their vehicles. Its been said that top quality stickers generally last for a minimum of 3 years. E Sticker provides colourful Bumper stickers for displaying all kinds of slogans and messages. They have a team of highly experienced and competent designers who make use of modern technology and equipment in order to accelerate the attractiveness of your brand. High-quality vinyl is used to print your stickers with to ensure it can be applied with ease to the bumper of all sorts of vehicles. Enter your details below and we will email you the details of these specials.